The hottest luxury watch right now among female celebrities — from television stars to Hollywood actresses to globally renowned recording artists to iconic fashion designers — is the Rolex Daytona in Everose gold. Although originally designed as a men’s watch, this sporty and ultra luxurious chronograph is perfectly suited for the fashionable woman’s wrist too. Sofia Vergara, Victoria Beckham, Paris Hilton, Ellen Degeneres, Hayden Panettiere, Kris Jenner, and Jessica Simpson are just a handful of stars often seen rocking their Rolex Everose Daytonas and wearing them beautifully. 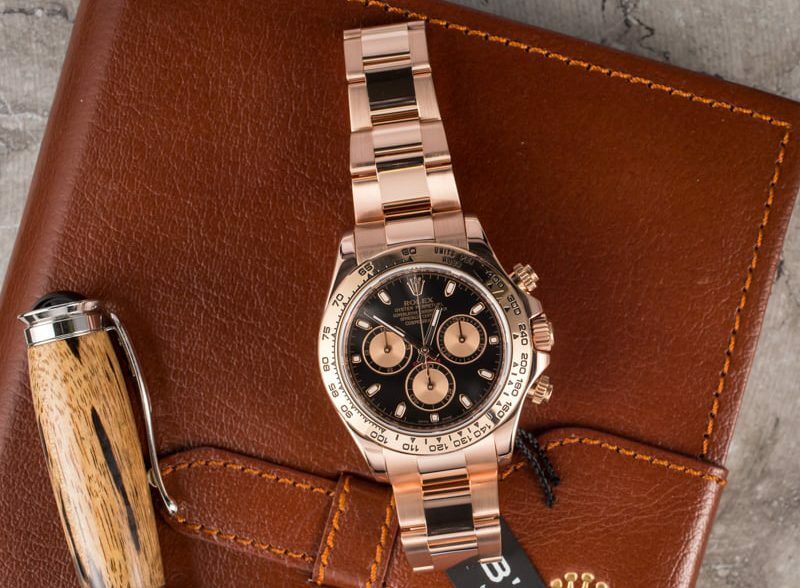 Instantaneously recognizable, the Rolex Daytona sports a 40mm Oyster case with two chronograph pushers at 2 and 4 o’clock framing the screw-down crown at 3 o’clock. 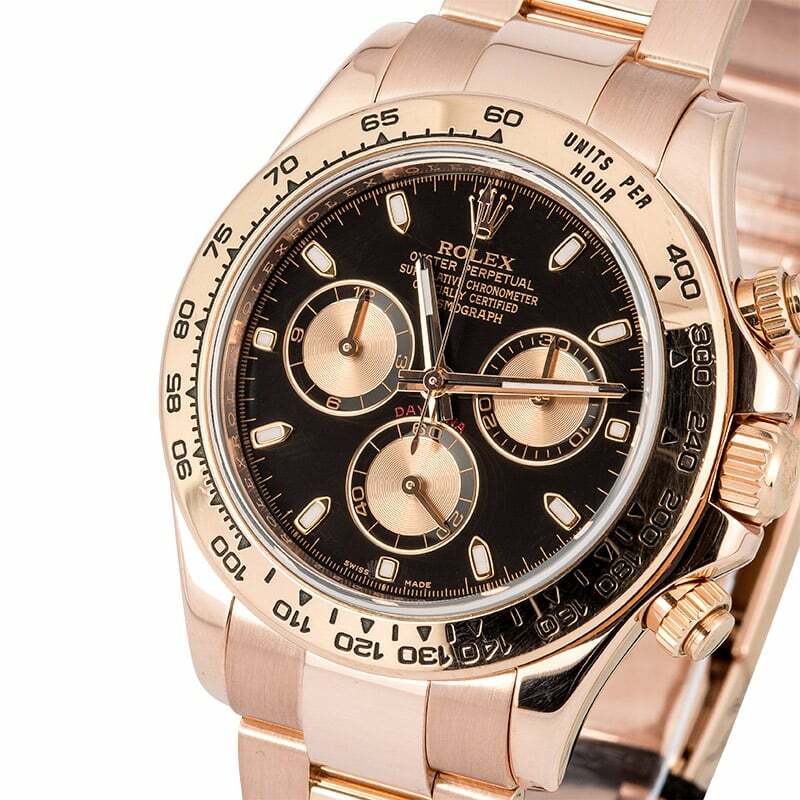 The face of the Daytona is particularly sporty thanks to its three registers at 3, 6, and 9 o’clock and is offered in a variety of dial option colors including a black dial with pink subdials, a pink dial with black subdials, a pink dial with pink subdials, and an ivory dial with pink subdials. 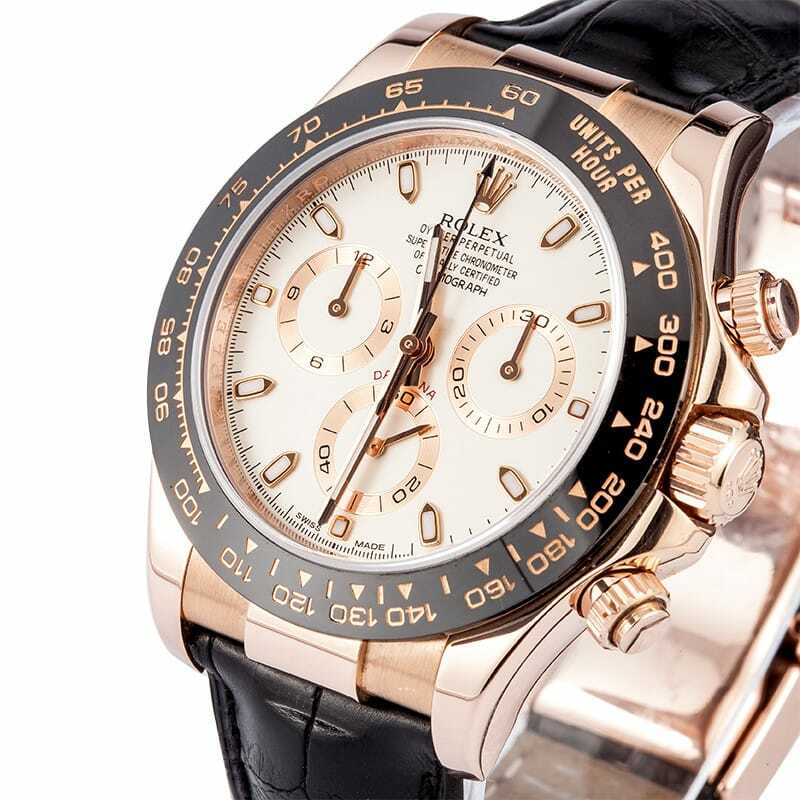 Wearers of the Everose Daytona can also choose between a pink gold bezel or a black Cerachrom ceramic bezel, as well as a full Everose 18k pink gold Oyster bracelet or Rolex leather strap. Among all the different configurations of the Everose Daytona, the top choice among the most stylish ladies is the full pink gold option from the case to the bezel to the bracelet. It’s the most feminine among the Everose models and the warm 18k pink gold lends a jewelry look to the iconic Rolex chronograph. 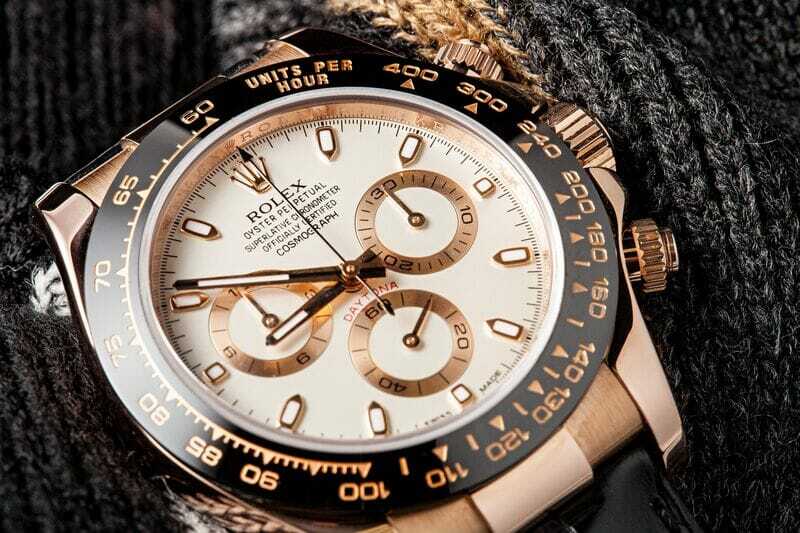 If you want to sell a Rolex that look similar to this one, you are in luck due to its resilient high value even amongst men’s Daytona’s. Everose gold is Rolex’s exclusive 18k pink gold alloy that is produced within the confines of their own in-house foundry. Making its debut in 2005, Everose gold is prized for its exceptional long-lasting luster, in addition to its durability. 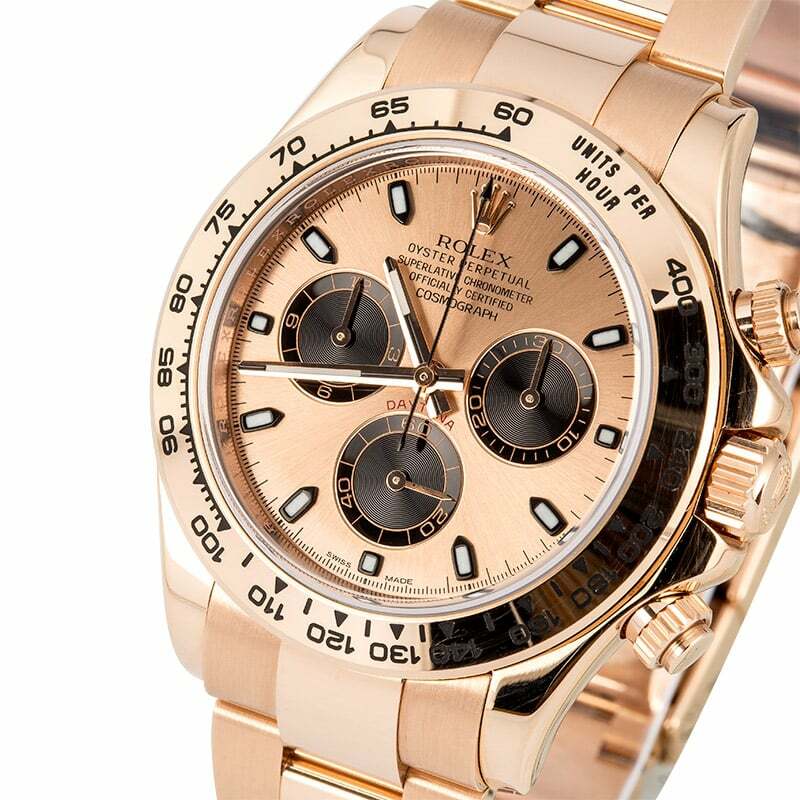 The very first Everose Daytona that was unveiled in 2008 was the ref. 116505 — the full gold version. The Daytona ref. 116515LN, with the black Cerachrom ceramic bezel and matching leather strap, joined the family of Rolex chronographs in 2011. Both models are still part of the current Rolex catalog. At the heart of the current Daytona watches is the Rolex Caliber 4130 mechanical chronograph automatic movement with 72 hours of power reserve. The movement is, of course, COSC-certified and the chronograph function boasts a precision to 1/8 of a second. The Daytona is outfitted with the Triplock screw-down crown thus the timepiece guarantees waterproofness to 330 feet (100 meters). Sporty yet chic, luxurious yet robust. 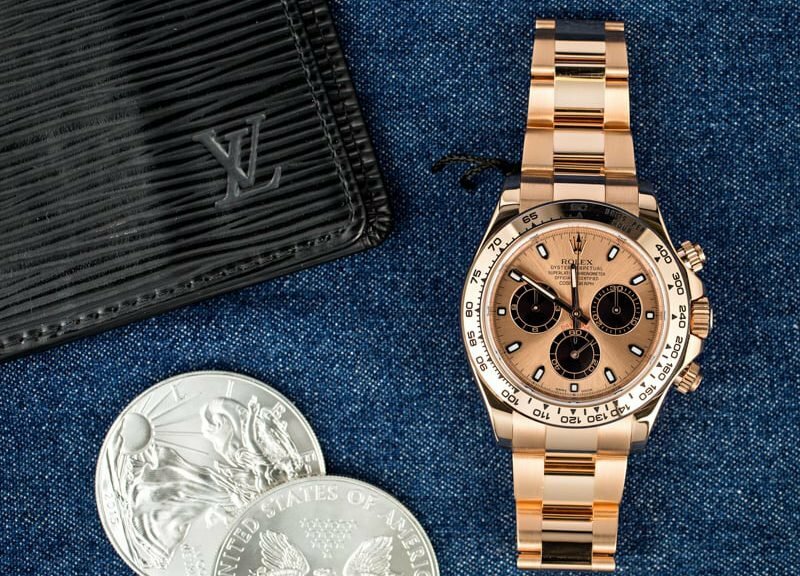 It’s no wonder that the Rolex Daytona crafted in 18k Everose gold is the leading choice of luxury wrist wear among Hollywood’s leading ladies.